Happy Holi! Finally spring is here and in Indian culture we celebrate that fact by throwing different coloured paint on each other with glorious abandon. And the great thing is, non-Indians are also getting in on the action. Flipping through a recent Time Out London, we turned to a whole page dedicated to Holi. Holi is super trendy apparently. And you can see why, it signals a time when we can feel happier and more energetic. Gone (hopefully) are the grey mornings, the dark afternoons and darker nights. It’s slightly warmer and much sunnier. Flowers are beginning to bloom and there’s a freshness in the air. We don’t know about you, but for us the new beginning doesn’t start with the New Year – it really starts with spring. I mean, how are you really supposed to get to the gym every day when it’s 0 degrees? How are you supposed to say no to pies and yes to salads when you can’t feel your face? No, spring is where it all really starts. This is where you decide to try a new hobby or sport, face a fear, try out a new look or just get out more. You may have had 101 excuses why you didn’t want to do something in winter, but there’s no excuse now! For us, both of us really getting into fitness. Now, this doesn’t come naturally to us – we’re basically sloths. And it doesn’t help that we love food – grabbing little bites of this and little licks of that as we cook. But spring is here and it’s definitely a time to get out, be more active and hopefully say “Bye Felicia” to our winter podge. 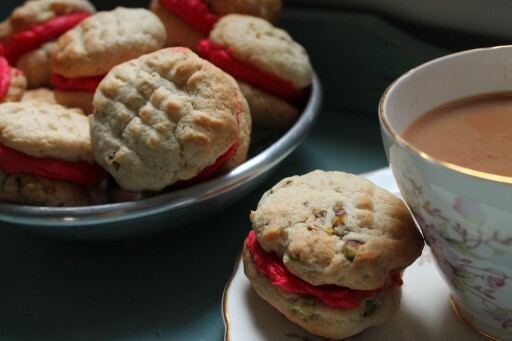 And since we’re burning all those calories, we totally deserve a little nankhatai with tea, right? If you haven’t been acquainted, nankhatais are Indian shortbread cookies that are sold on the street or in sweet shops and scented with cardamom. We mixed in chopped pistachios (protein?) 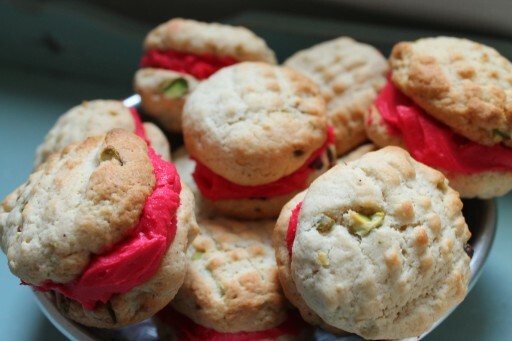 and sandwiched ours with rose water-flavoured cream. It was definitely a good call. In a large mixing bowl or electric mixer, mix the sugars and butter until fully incorporated and pale yellow in colour. Add the flour and gram flour. Mix thoroughly. Add the yoghurt, cardamom, nutmeg, baking soda and pistachios. Mix until you achieve a soft dough. Refrigerate the dough for 15 minutes. Using a fork, press the dough balls onto the sheet in a crisscross fashion, flattening them slightly. Bake for 10 minutes, one baking sheet at a time. Leave to cool on wire rack. In the meantime, mix the icing sugar and butter carefully until fully incorporated. Add the rose water and red food colouring and mix. Using the icing, sandwich the cookies together – you will need to spread a couple of tablespoons of icing on one of the halves. Enjoy with a nice cup of tea! 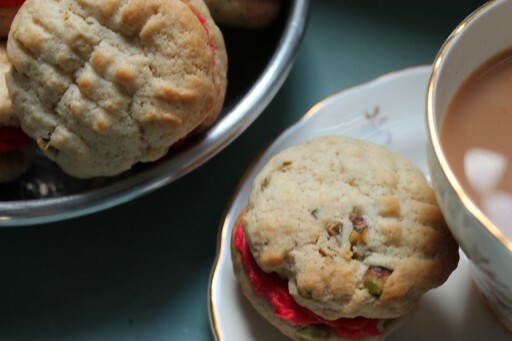 The cookies are best served on the day but if you keep them in an airtight tin, they are good for a couple of days albeit slightly softer.